Candy Clouds Blanket / Any-Size-Throw Crochet Pattern PDF ONLYThe sky’s the limit! Give Baby the sweetest of sleep and the best of dreams with this unbelievably luxurious and fun afghan. No matter what time of year Baby is expected to arrive, this blanket is suitable for any season—just add a ribbon in appropriate color, and watch little eyes grow wide in delight before Baby snuggles into the clouds for a nap! 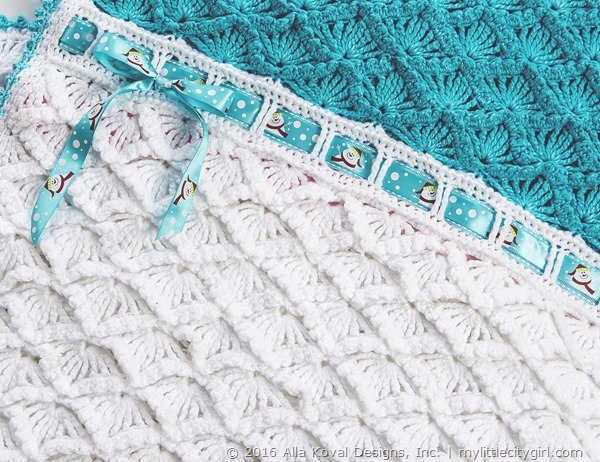 IMAGINE THIS: Because the blanket size is so easily adjusted, make it a baby blankie, a king-size comforter, or crochet just first two-tree pattern repeats to make a pretty and delicate scarf for yourself. 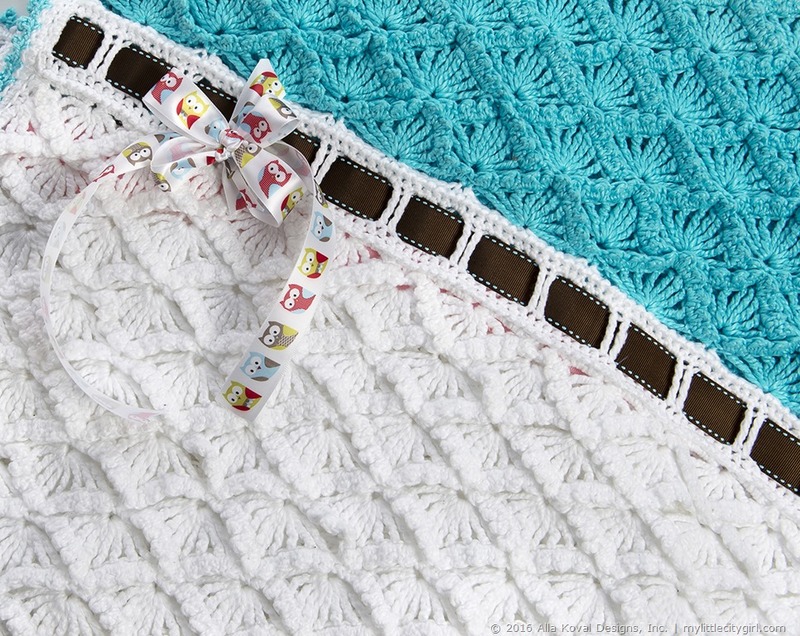 Even more, crocheting two repeats of both sides of Blanket with a ribbon in a middle, will make a playful-any-season accessory for your little one! But why stop here?! Crochet it with gorgeous merino wool yarn for cold days, or use any yarn weights for other seasons and occasions. Make an equally stunning blanket in colors of your choice! Below are some season-ribbon-inspiration from my stash… but why stop here?! Crochet with gorgeous merino wool yarn for cold days, or use any yarn weights for other seasons and occasions. 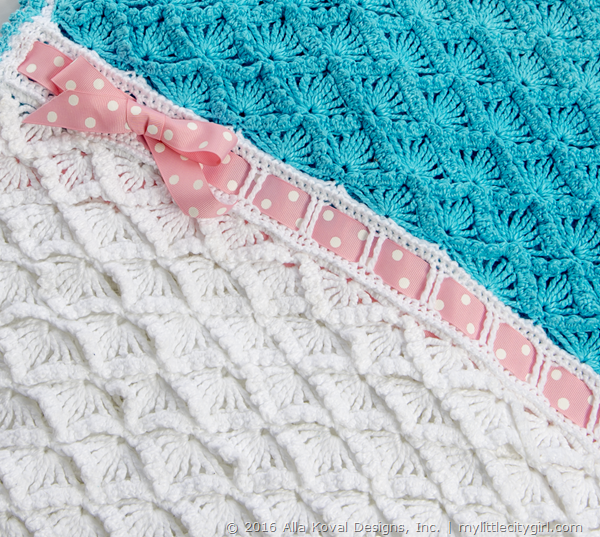 Make an equally stunning blanket in colors of your choice! 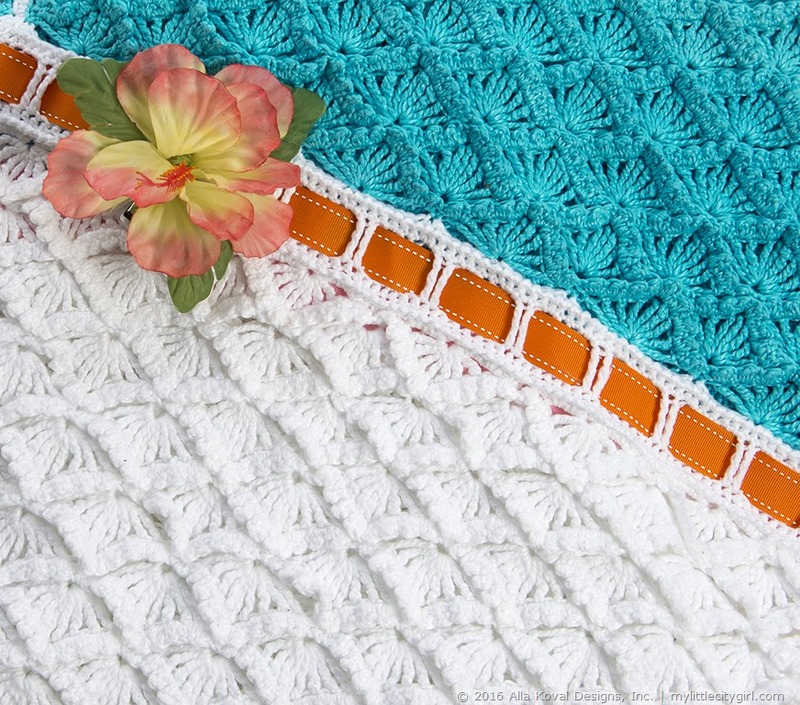 20 pages, 5 photos, 4 stitch diagrams, a schematic, 4 tutorials: Spike (Long stitch), Two Ways To Crochet Picot, Weaving a Ribbon, Reverse Single Crochet (a bonus ;o); technical pages: Glossary, Terms, Conversion charts charts, Yarn Substitution Chart.